Now that you are stuffed full of turkey, mashed potatoes and Thanksgiving desserts, it's time for the real DESSERT! Kidrobot has some fun plans for #KRristmasTime that you won't want to miss! Make sure you are not only following Kidrobot on social but also subscribed to receive instant notifications & updates from Kidrobot OR you are going to wish you did! Get gifts for everyone on your list with our biggest and pretty much only sitewide special this year! 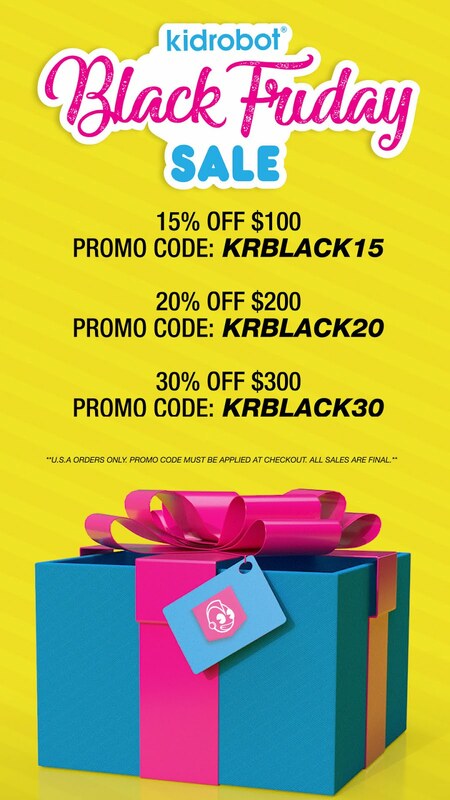 Get up to 30% OFF everything with no maximum from limited edition art toys to plush to blind boxes to YES... even Art Giants and Labbit Stools (while supplies last) when you add these special Black Friday promo codes at checkout online at Kidrobot.com.